Last week we visited the Israeli village of Netiv Ha’asara near the border with Gaza and met with Roni Keidar who lives there. You can just see Gaza behind Roni, and the photo below shows the wall and Gaza behind. It is very close indeed. Roni told us of her life in the village. The families all own a piece of land and grow flowers and vegetables on the fertile soil. Every home has a bomb shelter. There are shelters by the roadside, and by the bus stops where children wait. People have 15 seconds to get to one after a warning siren. She told us of life of fear in the village, with constant sirens, but she stressed that they lived within the recognised international boundaries of Israel, and therefore they would not move. Roni is an active member of the Israeli peace organisation Other Voice. You might like to look at their website site and sign the petition. Other Voice campaigns for peace, and believes violence cannot be the answer. 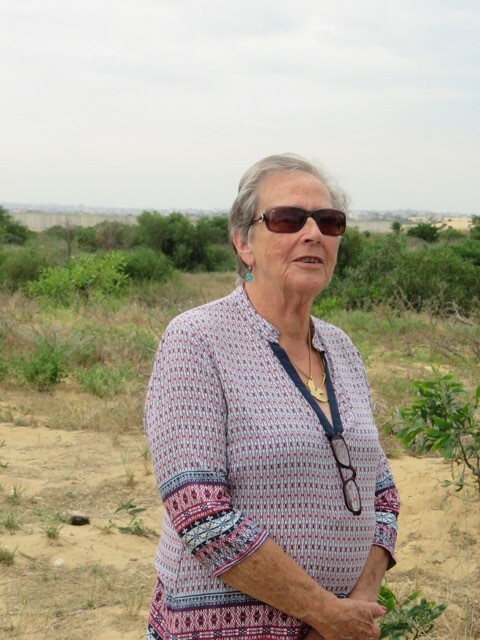 Roni told us that despite the closeness of Gaza to her community, she believed the Gaza blockade should be lifted, so that the people of Gaza could begin to have normal lives, rather than being trapped within the borders with nothing to lose. She acknowledged the risk to her community if that happened, but said they were at risk all the time anyway. She stressed that to support a Palestinian state was not anti-Israeli. 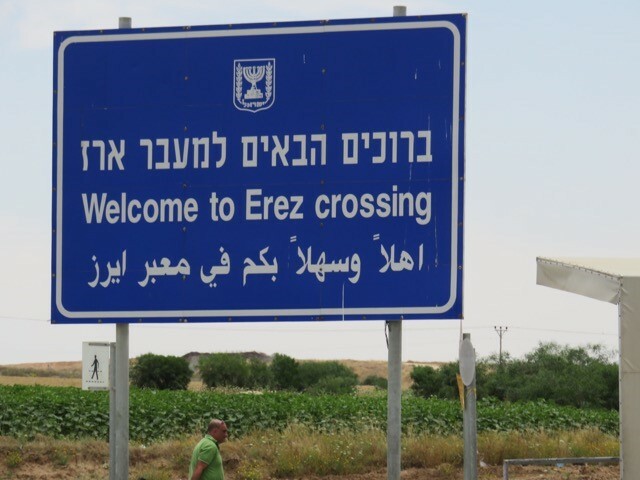 The photo below shows the main checkpoint to Gaza. This checkpoint was seen often on TV last summer. EAs do not work in Gaza but our talk with Roni reminded us that it is indeed a part of Palestine, and the events of last summer certainly impact on the people in the West Bank and Israel and our work, so it is good to look at what is happening there. This graphic, taken from an article comparing Gaza to various cities around the world, shows the area in relation to London. Gaza has recently been very much in the Israeli news with a report published by a group of Israeli ex-soldiers called Breaking the Silence. The report gives testimonies from Israeli soldiers who took part in what the Israelis call the “Gaza War”. Please do look at these testimonies. Future blogs from me will be about our work in East Jerusalem and the West Bank, but I hope you do not mind this chance to remember Gaza as a part of Palestine, as we have been asked to do by an Israeli peace activist. 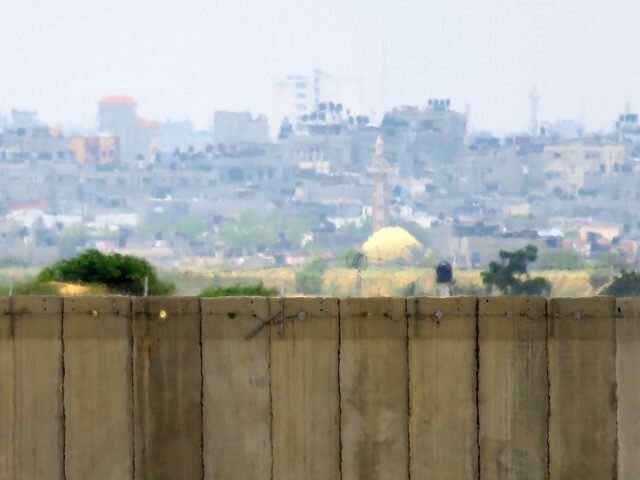 This entry was posted in Access and movement restrictions, Current EAs, East Jerusalem, Gaza, Impact of occupation on Israelis, Israeli and Palestinian peace workers. Bookmark the permalink.